This is possibly the best, and certainly the easiest, gluten-free and grain-free cracker you can make at home. The hard cheese (parmesan and romano are my favorite) melts together quickly, and hardens when it cools. They stay together well and are a little crispy and a little chewy (depending on how long you cook them). They are very tasty on their own. They tend to be quite salty, so if that’s a concern, pair them with something more mild in flavor. You can also add seasoning to balance out the salt—you can go sweet or earthy with basil or oregano, or add some heat like curry powder or cayenne. They are the ultimate and very literal cheese cracker. fresh, finely-ground hard cheese, such as parmesan (Parmigiano-Reggiano) or romano (Pecorino romano) - By fresh I mean whole wheel piece or the freshly-grated cheese, not that weird shelf-stable garbage with suspect additives in brightly-colored plastic tubs found in the supermarket! Line a baking tray with parchment paper. I often use a toaster oven. 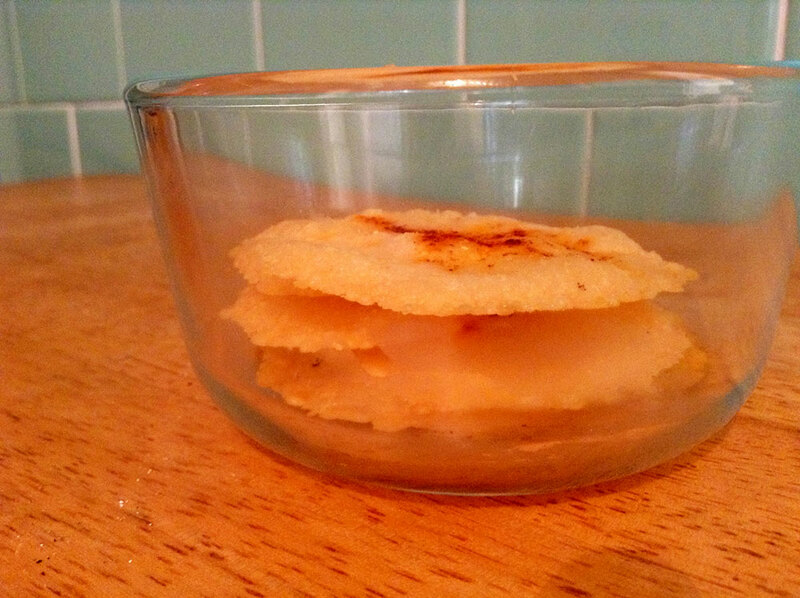 Drop spoonfuls of cheese onto the paper, depending on how big you want the crisps. I like to do them pretty small, less than a tablespoon each. Don’t worry about spacing them out; they don’t expand. Pat down the cheese evenly with the back of the spoon, so they’re a little thinner than a regular cracker (about the thickness of a rice cracker). Gather in the edges a little bit, so all the cheese is touching. As you can see, I don’t get all that picky about it. Optional: Sprinkle on add-ins. 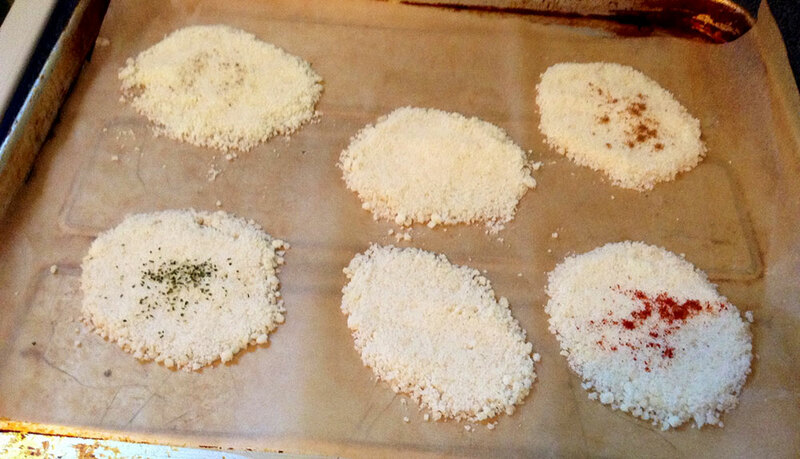 Use any dried, finely-ground salt, seasoning, spice, or herb that you like with cheese. The possibilities are astonishingly limitless; what doesn’t go good with cheese?! Pictured above are, clockwise from top left, black pepper, roasted cumin, smoked paprika, and sweet basil (the middle ones are plain; those are just fine too!). Another option is to stir some seasonings into the cheese before you spoon it onto the tray. I haven’t actually tried this yet. 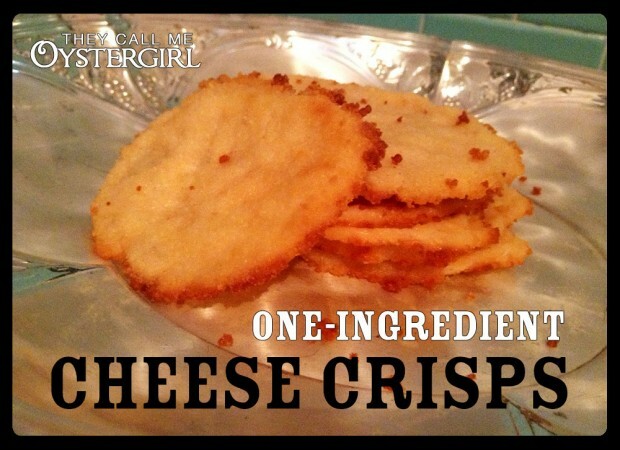 It shouldn’t affect the quality or texture of the crisp if you use seasonings sparingly. Bake at 375 degrees for about 4–5 minutes. Keep an eye on them. 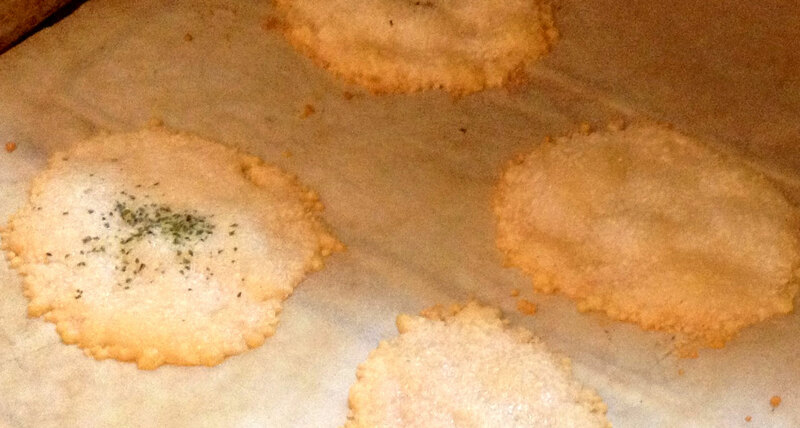 When the cheese starts to bubble and the edges get a little darker, take them out of the oven. Or, leave them for another minute or two, if you like them crispier rather than chewier. Let them cool and firm up for about 5 minutes. Lift with spatula, gently at first to make sure they’re solid. They are best when they are fresh; so eat them up! What seasonings would you put in your cheese crisps? Santa Maria! These look awesome, and my kind of easy! I’m thinking of using my micro-grater to get the cheese very finely grated. I might add some sesame seeds or toasted pumpkin seeds. Maybe a dash of raw sugar on a couple, or maple sugar would be even better. WOW. Only drawback: I imagine quite expensive. But for wonderful treat, I can’t wait to try this! Sesame or pumpkin seeds sounds great! I wouldn’t have thought to put anything whole or chunky in like that… it could work. I have made these a couple of times with Romano, and my husband told me to NEVER make them again when he is home, lol! I love it, and it is crispy, and just what my taste buds want. hah, yeah… When I make them in the toaster oven, the smell doesn’t seem to permeate so much.